“Election 2010: The Environment by the Numbers” a just-released analysis of Monday’s election, shows a majority of Toronto’s new Councillors have committed to building a green Toronto. Torontonians made it clear they wanted a different kind of Mayor. They also made it clear they want the new Council to be green. That’s why they elected 24 Councillors from all corners of the City who committed to implementing key environmental actions that build on 10 years of environmental success. While Toronto’s new Mayor has ignored the environment, a majority of Toronto’s new Council have committed to building a greener Toronto. To make sure this commitment is honoured, we need your help. environment a priority. If your Councillor committed to our 6 environmental priorities, write a letter to them reminding them to honour their commitments. We will personally deliver these letters to City Councillors before the first Council meeting. Read More about what you can do. TEA evaluated and graded almost 30 mayoral candidates on their commitment to continue building a green Toronto. The Mayoral Candidate Environmental Report Card give scores, grades and comments for the top four mayoral hopefuls in Toronto based on a survey of 20 questions about 6 Environmental Priorities. TEA has evaluated and graded over 200 council candidates in all wards of the city based on answers to our survey about their environmental commitment. TEA created a 20 question survey based on the 6 Environmental Priorities identified by TEA and endorsed by organizations and individuals across the City. These priorities identify key action areas for the next mayor and council to work on to build on the last ten years of environmental progress at the City. A summary of the grades, detailed survey answers and the survey questions are available here. On Thursday September 23rd, we hosted an Environmental Priorities Mayoral Debate. This debate was an opportunity for the top mayoral candidates to tell Toronto what their environmental commitments and priorities are, and to ensure that the environment is a top issue this election! The debate focused on our 6 Environmental Priorities and considered questions suggested by our members, allies and friends. The debate was moderated by Gord Miller, the Environmental Commissioner of Ontario. Our mid-campaign report card examines what the top Mayoral candidates have said about Toronto's six Municipal Election Environmental Priorities. These priorities are endorsed by a growing list of community and environmental organizations across Toronto. Candidate evaluations are based on remarks and statements made publicly at debates, in the media and on the candidates' websites, as well as on-the-record to us, the Toronto Environmental Alliance. We hope this mid-campaign report card will help guide candidates as they develop their environmental platforms. 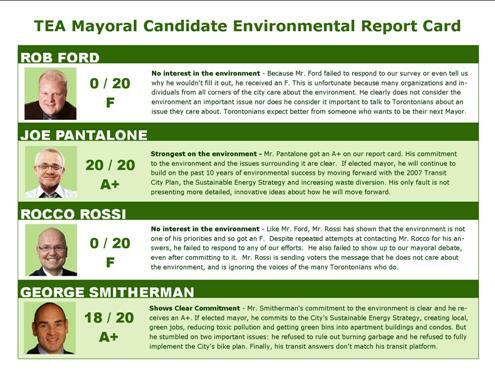 We also hope Torontonians will use this report card to discuss environmental issues with candidates. Download the report card here [pdf] or read more here. Three-way elections like Toronto's mayoral race always lead to the same question: should a person vote strategically for another candidate if their number one choice appears unlikely to win? Political pundits love this question because it allows them to recycle decades-old arguments either for or against strategic voting. The fact is it’s extremely difficult to determine—until after the election—whether strategic voting will help or hurt in achieving a particular outcome. In the end, people who care about strategic voting will have to decide what to do based on what their gut tells them, not the evidence. Unless bizarre things happen on election day, Toronto will wake up to another green Council on October 26: that’s what the results of our recent environmental survey suggest. This means whoever becomes Toronto's next mayor will have little opportunity to do anything but continue building on ten years of environmental success in the city. The upcoming municipal election is now being characterized as suburban voters being angry with an outgoing mayor and council who they think have a bias in favour of downtown. Leading this charge is mayoral hopeful Rob Ford, who wants voters to believe that a wasteful, corrupt City Hall is harming the suburbs to the benefit of a small downtown elite. it ignores an important reality that is fundamental to the survival of this city: we all need a healthy environment to survive and thrive. The way we make decisions and policies can be as important as the decisions themselves. One issue that has been largely neglected in the upcoming municipal election is how we make decisions that end up affecting the environment. Consider: if a decision-making process increases the chance of making bad environmental policies, shouldn't we avoid this process? Some candidates hoping to become Toronto's next mayor are promising to change key decision-making processes, which could lead to bad environmental policies. The best example of this is changing how the TTC makes decisions. Who is the Most Environmentally Responsible Politician Running for Mayor of Toronto? With less than 90 days before Torontonians elect a new mayor, a growing number of people will be wondering: who is the greenest candidate? 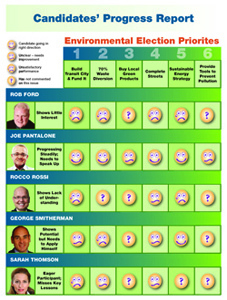 To help inform voters the Toronto Environmental Alliance released a mid-campaign report card in July that set out what the top candidates have said on the six key environmental priorities. In the fall, TEA will be releasing a final report card assigning letter grades to all candidates. While Torontonians wait for these results, it’s also important to consider what candidates have done in the past to help green Toronto. For 10 years Toronto has worked hard to solve key environmental problems facing the city. Investments to expand public transit and create a city-wide green bin program and programs that promote energy efficiency and green power all curb climate change, clean the air and create necessary and new green jobs. 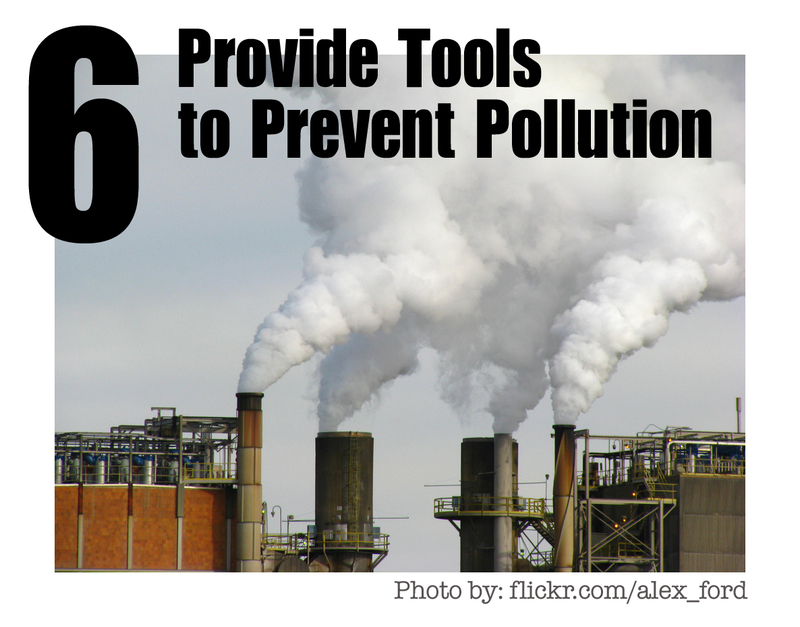 Policies that reduce toxic pollutants make for healthier communities and businesses. All of this happened because Torontonians and successive City Councils believed that environmental solutions are a priority. Over the coming months, Mayor and Council candidates will be speaking to Torontonians about their vision of the City. While there may be disagreements on other issues, everyone should agree we must continue to build on Toronto's environmental successes. Below are 6 priority actions, in no particular order, that will build on 10 years of environmental success. Investments in each action won't just improve our environment, they will lead to better health and save us money as we avoid some of the huge financial costs associated with traffic congestion, waste disposal, climate change, and illnesses due to pollution. We call on every candidate to endorse these 6 priority actions and work towards implementing them over the next term of Council. 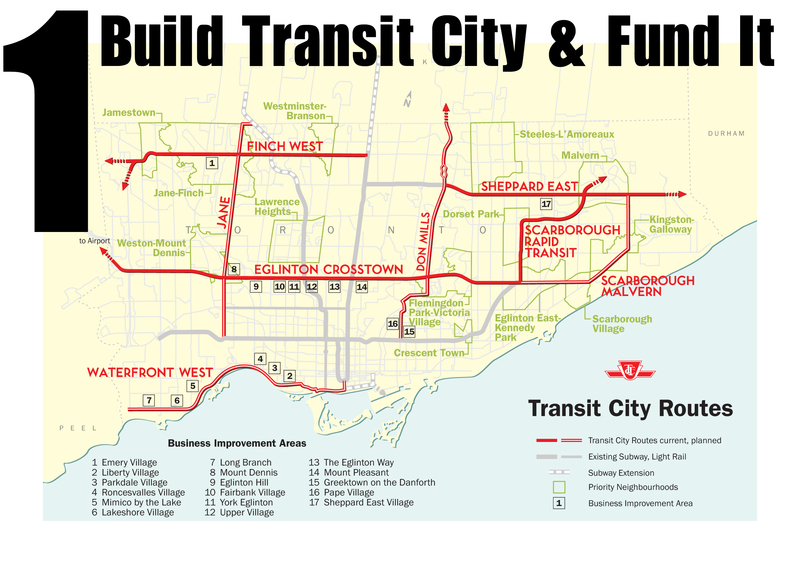 By 2011, the new Mayor and Council must work with the TTC and upper levels of government to develop an affordable, equitable and long-term funding strategy which covers at least half of the TTC's operating costs. The next Council must ensure that all apartment buildings in Toronto have Green Bin collection service by the end of 2011. 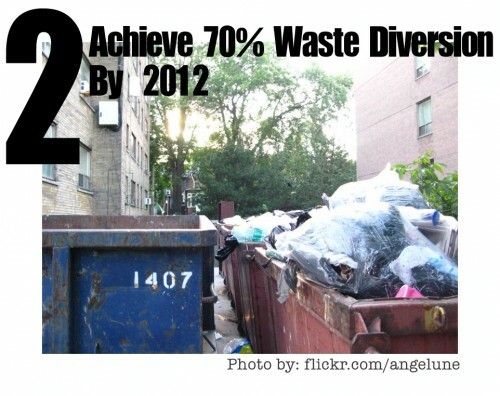 One year later, other waste diversion programs must be in place so that the City meets its 70% diversion target by 2012. 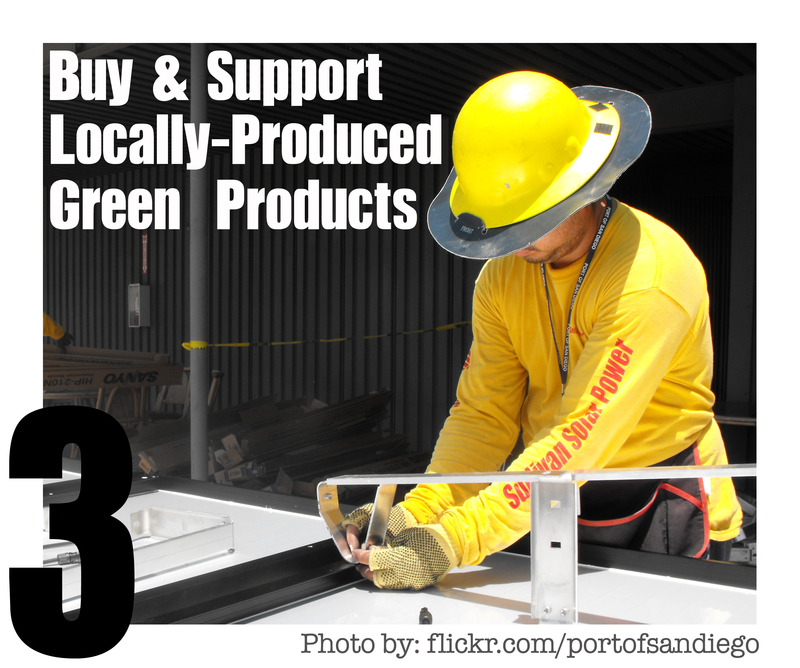 The next Council must require City purchases of green products to give priority to local workers and local manufacturing. 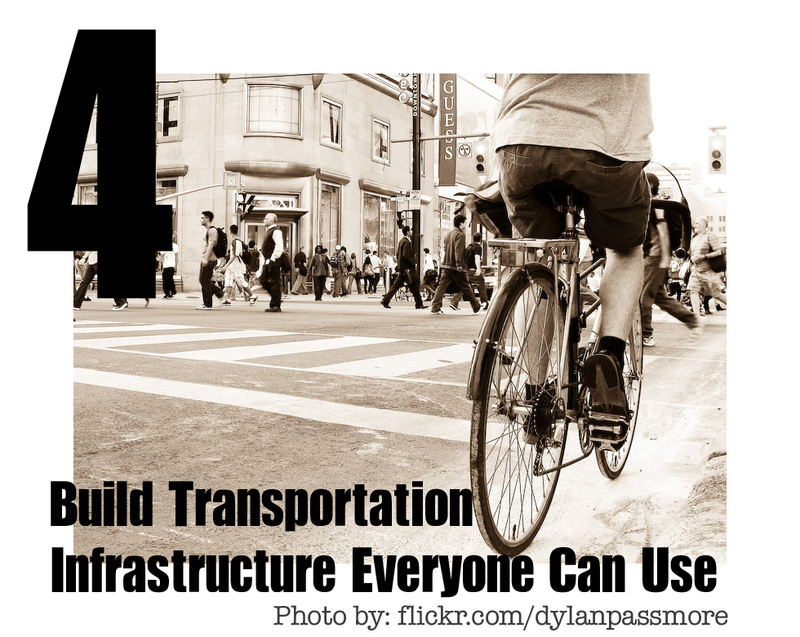 The next Council must develop and implement a "Complete Streets" policy by 2014, fully implement the Toronto Bike Plan by 2012, and launch a public education campaign targeting all road users about road sharing and responsibilities. 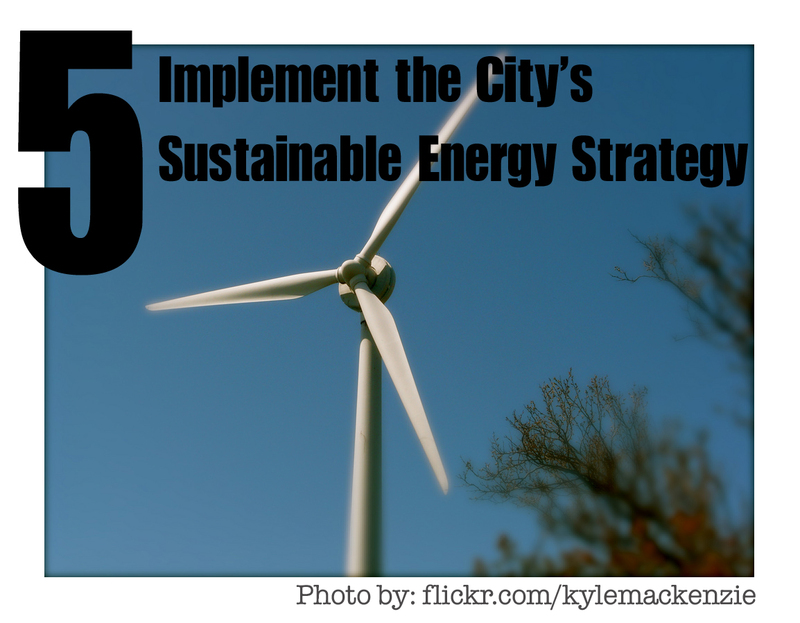 The next Council must implement the City's Sustainable Energy Plan starting with getting the partnership between the City, Enbridge, Enwave, and our publicly-owned Toronto Hydro working and home energy retrofits underway by 2011. By 2011, the next Council must have in place the tools small businesses need to devise pollution prevention plans with clear reduction targets.